This is not your ordinary broadcast! In true Road to the Horse fashion we’re exploding boundaries and exploring new territory by creating a cutting-edge experience for fans. For the first time ever, RTTH world champions Dan James and Craig Cameron will be on hand throughout the live broadcast with a play by play recap, as well as educating fans on the rules and format of the event. They’ll also be interviewing a host of celebrities, past Road to the Horse world champions and special guests. Blend these two dynamic personalities in a live broadcast and you’re guaranteed a production to leave you smiling! As fans pack and get ready to flock to the Alltech Arena to witness the very first all-cowgirl World Championship of Colt Starting, at Road to the Horse 2017, Ride the Remuda Productions is busy creating a state-of-the-art live broadcast to bring the action to fans around the world. Not only will fans around the globe take front row seats to eyewitness every minute of the event, they’ll also be enjoying an exclusive colorful commentary by past Road to the Horse World Champions Dan James and Craig Cameron when they sign in with any electronic device. Whether you watch it on your iPad, iPhone, smartphone, tablet, laptop or TV, fans will enjoy hassle-free streaming and 24/7 customer support. Fans can preregister here for the broadcast and test their computer system to be sure they’ll enjoy problem-free streaming when the event kicks off. Live coverage will begin March 23 and extends until the new world champion has been crowned on March 26. Can’t watch it live? No problem. Video-on-demand event footage is available 10 days after the completion of the event. As a special bonus, fans will be able to watch the entire day’s events on Thursday, March 23, at no cost. James is no stranger to Road to the Horse. The much-loved Aussie import not only wears a coveted Road to the Horse World Championship Gist Silversmith buckle from 2012, he has since returned annually to the event as a fan favorite entertainer. Cameron’s megawatt smile and captivating personality is right at home at Road to the Horse. Capturing an event title in 2006, Cameron has returned many times as a celebrity, host and competitor. Bringing together the finest horsewomen from around the world, the very first Celebration of the Cowgirl at Road to the Horse 2017 is unlike any other World Championship of Colt Starting. Multiple World Champion NRCHA cowgirl and horsewoman Sarah Winters returns as a veteran competitor at Road to the Horse. Fellow competitor and newcomer to Road to the Horse Kate Neubert comes from a strong family tradition of colt starting and has amassed over $200,000 in NCHA earnings. Hauling from Florida, Rachelle Valentine will also enter the round pen at Road to the Horse for the very first time. 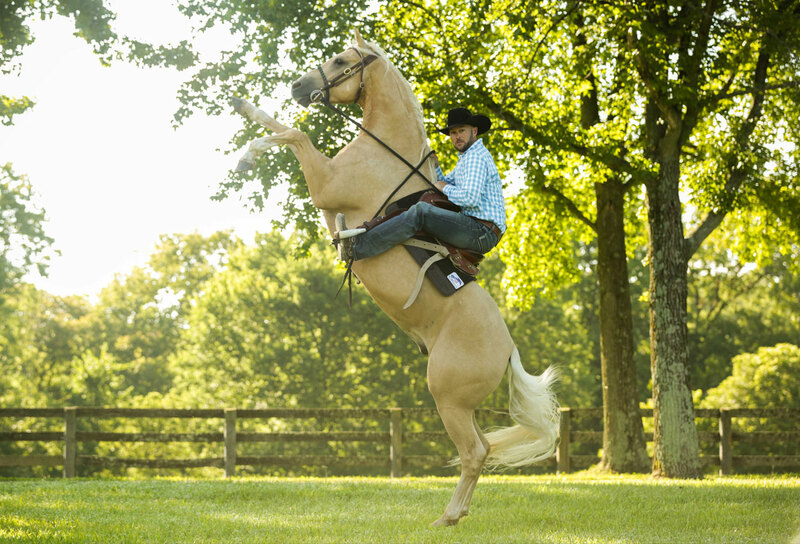 Her passion for developing young horses led her to a successful career in the reining horse industry. New Zealander Vicki Wilson, not only enters Road to the Horse as our very first competitor from New Zealand, but this author, TV celebrity and trainer is also the very first international show jumper to bring her helmet and jodhpurs to Road to the Horse.